I was never like the other little boys. Nana loved her National Enquirers and I remember stealing away to my bedroom with their expose on Heather O’Rourke’s sudden death and sobbing hysterically, holding onto my toy chest with all my might and wishing that God hadn’t taken her away from us. This was my first encounter with the death of someone who I really cared about. I was nine years old. Poltergeist III (1988) was released about six months later and has gone on to be one of the most bizarre sequels ever made. It's best not to think of Poltergeist III in relation to Poltergeist at all; for it exists in a bizarro world where Carol Anne’s parents (despite the fact that they moved heaven and hell to keep her safe) decide that they’ve finally had enough of Carol Anne and abandon her with distant relatives on the east coast. 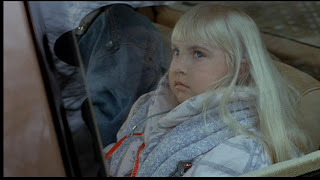 You know I love a film where parents up and leave their children for no good reason, Poltergeist III is no exception! Tom Skerritt and Nancy Allen (at a reasonable weight) play the most leathery and emotionally vacant couple imaginable. Like the cold, steel high rise they call home, Tom and Nancy are devoid of sympathy for little Carol Anne. For reasons unknown, they take her in as a ward, but they hate her - in fact, everyone in this movie hates her! Carol Anne goes to a savant school in Chicago where she’s treated by a catty, gay psychoanalyst named Doctor Satan (spelled Seaton). Reverend Kane, like her guardian angel from Hell, doesn’t approve of her new living situation one bit so he… wait. I’m getting ahead of myself. A haunted house movie set in a luxury skyscraper in the middle of a big city is an awesome concept. Gary Sherman had directed Dead & Buried, which is one of the better horror movies, and he came on board with the best of intentions: to make a contemporary haunted house movie using mirrors and practical on set effects. A high society art dealer is married to an older, distinguished man with a teenage daughter who has a penchant for late night pool parties with her horny girlfriends and their fashion conscious gay best friends. Being a family of narcissists, they are surrounded by reflective surfaces. Ghosts are trapped in the reflections adding an air or spookiness to their modern, city living. This could have been a good movie, but something went terribly wrong along the way. Making this a Poltergeist movie was a mistake bordering on exploitation. Heather was really sick and in no condition to make a movie, it’s actually hard to watch. The precious little angel from Poltergeist was fighting for her life and they let the cameras roll. Without Jerry Goldsmith’s score, or Jobeth Williams emoting, or the attention to every minute detail that made Poltergeist the classic it is, Poltergeist III is the black sheep of the series. Poltergeist II: the Other Side goes off the rails and is missing the crucial Dominique Dunne element, but the performance of Julian Beck (who was on death’s door himself) as Reverend Kane and its exploration of Native American mysticism as well as the long tradition of paranormal sensitivity among the women in Carol Anne’s family made it a worthwhile endeavor (also, please note: Craig T. Nelson is ridiculously hot). Poltergeist III has no Julian Beck, no Jobeth, no Dominique, and we all know that Tom Skerritt is no Craig T. Nelson. Tom Skerritt looks like an ash tray and Nancy’s base is at least a shade lighter than her natural skin tone and Carol Anne is a little bit too old to be wearing that primary red onesie. Regardless, I kind of love this movie. Had they not tried to incorporate Carol Anne - if Tangina and JoBeth’s sister were the sole connection to the franchise, it would have been a much more effective and interesting movie. 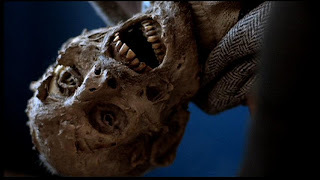 This movie is not well shot, there’s no continuity or logic to speak of, and the synthesized score is just awful when compared to the masterpiece scores of Poltergeist and Poltergeist II: the Other Side…so why is Poltergeist III such a delicious guilty pleasure? Well, in addition to having an apathetic, heavily made up, barren, second-wife female lead with shoulderpads, Poltergeist III has haunted ice cars and magical amulets and Lara Flynn Boyle in V lizard makeup. How can you resist it?! For all there is to know about this movie - how it came to be, what went wrong and why (it’s production history rivals that of Heaven’s Gate), be sure check out David Furtney’s brilliant website: http://www.poltergeistiii.com/. It’s everything! I love that movie too! So cheesy and nonsensical! How can you not love it? Shoulder pads? Check! Big hairdos? Check! Mystical amulet rubbing? Check! And I know what you mean when you said you cried your eyes out when poor Heather died. I was 8 years old myself, and I'll never forget that day when she died. My mom told me as soon as I came home from school, and I was in shock!